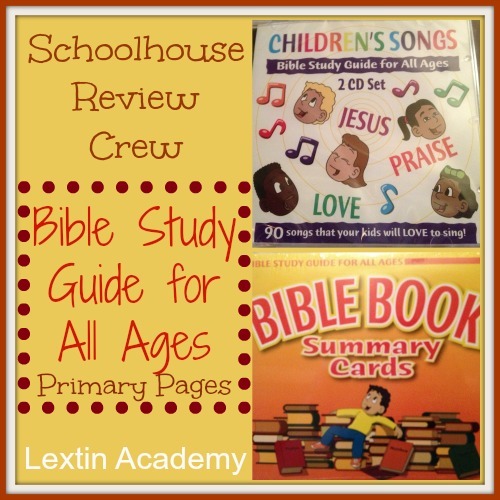 We have been using Bible Study Guide for All Ages in our homeschool and I have been amazed at what my children have learned and retained through using this resource. I have learned quite a bit myself as we study the Scriptures together and dig deep into each Bible story. We have used the Beginner Pages and the Intermediate Pages so I was excited to review the Primary Pages for Curly since the Intermediate Pages were a bit of a stretch for her this year. Bible Study Guide for All Ages is Bible curriculum designed to be used with multiple levels of students. Each student studies the same passages of Scripture, just at various depths and levels. The program covers all of the Bible in a four year cycle with 104 lessons in each year. The lessons do not move through the Bible from start to finish, but rather students cover some Old and New Testament topics each year. The program contains student pages to correspond to each level. These pages have review, timelines, maps, and pictorial representations of the Bible lesson for the student to draw on and color. The Pages are sold in set increments of 26 lessons per set. You can purchase each set for $5.95 and the accompanying Teacher Guide for each set of lessons for $9.95. The Student Pages each start with a review of previous lessons. Section B has memory work, some of it is taken from songs on the CD’s or the summary cards. Section C is information to know about the lesson and includes definition of words that will be used in the lesson. Part D is the text of the lesson with the pictures to accompany the story. It is located on the back of the page. Section E is a timeline or a map (it alternates each lesson). Part F is the Apply It section and contains a modern day pictorial example of the concepts learned in the lesson. The Teacher Pages follow the same order as the student pages but contain more information. The beginner of each lesson lists the objectives and any materials needed. The answers are given to Part A. Part C contains the instructions for the student to complete that section on his/her page. Part D contains the same text that is found on the student’s page in addition to the instructions for what to fill in, circle, or color on the student pages. At the bottom of this section are a few review questions of the lesson. The last page of the Teacher’s Guide contain instructions for the map or timeline (as well as answers) and instructions for completing the wall maps or wall timeline (if you are using those components of the program). Also, the background story of Part F is given and a few discussion questions are included to help the student apply the material. The Bible Book Summary Cards retail for $24.95 and they come in two sizes: full color 8.5″ x 11″ or black and white (to color yourself) 11″ x 14″. Each summary card contains a picture that represents the book of the Bible on the front. The back of the card has a brief summary of the events and important people that are in that book of the Bible. At the bottom of the card are a few review questions to test retention. I put all of our summary cards into page protectors and placed them inside a large binder so we could flip through and review the cards while keeping them in order. The Children’s Song CD set of 2 CD’s retails for $19.95. This set of 2 CD‘s contains 90 songs that are sung a capella. The songs were ones that I remember singing in church when I was growing up. My kids’ favorites were “This Little Light of Mine,” “He’s Got the Whole World in His Hands,” “Day 1” (about the days of creation), and “One, Two, Three, Jesus Loves Me.” We also enjoyed learning the names of all the judges (set to song) and the apostles (a chant). We chose to do 4 lessons per week. I worked on the lessons with Curly in the evening. We got out our crayons and our materials and sat together on the couch and did our Bible time. Here’s what our time looked like when we covered lesson 10 – Joseph Reveals Himself. The objective was to see how God has a plan to do good things in our lives. Next we did our memory work and I had Curly name the two parts of the Bible and we sang the “Twelve Sons of Jacob” song from the CD. We began section C which had information about a cart (two wheeled vehicle pulled by oxen). The next section is the Get Active section which includes a short object lesson. I usually skip these because I don’t want to gather the supplies (even if they are simple ones). Curly was ready to begin the meat of the lesson so we turned our pages over and started reading through the Bible story. She followed along on her pages and looked through her pictures as I read. Then I gave her instructions for how to complete each picture such as: “Write Who sent Joseph to Egypt” and “Circle the reason why Joseph was sent to Egypt.” Curly enjoys looking through the pictures and completing each one. Part E was a map to complete. Curly traced the tent in Canaan and drew a triangle over the land of Egypt. For Part F we discussed the picture of the boy sitting on the floor with a pile of blocks in front of him. We talked about how he needed to make a plan for what to build with those blocks. Just like the boy needed to make a plan, we need a plan for our lives. And God is the One who has made the perfect plan for our lives. Then Curly enjoyed coloring her picture once we were done with our lesson. When using the Teacher Guide, there is a lot of flipping between pages. Each lesson (which is one double-sided page in the student’s pages) can cover 3-4 pages in the Teacher Guide. I felt like I had to turn lots of pages to keep up. In addition, the pictures from the lesson and the text of the lesson are not on the same page. I kept having to flip back and forth between text and pictures to follow along with Curly’s lesson. The manual is comb-bound at the top, and it would have been helpful to have the pictures on the top page with the text at the bottom so I could have the book open and view both pages at once. There are also a few lessons that require the teacher to go back a page or two to the activity section to finish the object lesson after the lesson text has been read. The program has a lot of components! It can be overwhelming to decide which ones to use. If you utilized the full program you would need the CD, Bible Summary Cards, Wall Maps, Wall Timelines, Teacher Guide, and Student Pages. This level does not flow well when used concurrently with the other levels. The website does specify that this level works best used alone. This could be a problem if you have students of various levels like I do currently. Using this level alongside the beginner level would require me to teach the beginner and primary pages separately as they both require a large amount of parental involvement. The primary pages would work better when used with the intermediate pages because an intermediate student would complete much of his or her pages independently, allowing you to work with the primary student. Did I like the Teacher Guide or not? I’m still a little torn. It was sometimes a pain to flip back and forth through the booklet while glancing at Curly’s page to see how she was doing. However, it was nice to have my own pages to read from rather than reading over Curly’s shoulder for her lessons (which was what I had to do when using other levels). So, I liked having my own text to read aloud but I disliked having multiple pages to get through. My favorite part of the primary program was the answers! One thing that is not included with the other levels are the answers to the review questions and maps. Sometimes mom does NOT know where Babylon is or an obscure fact from the book of Job. I’m learning too! While I can look up the Scripture (as Scripture references are given) and I can find a map of the ancient world, it was so nice to have the answers right there at my fingertips to help guide Curly. I LOVED having the map answers! I sometimes struggle with those maps! The beauty of this program is the ability to teach students of all levels at the same time while covering the same passages of Scripture. I love that this program allows us to study the same Scriptures and Bible stories together. The CD is a wonderful resource for learning Bible songs as well as facts about the Bible such as the sons of Jacob, the days of creation, and the names of the judges. I have found the Bible Summary cards to be an invaluable resource. They are brightly-colored pictorial references of each book of the Bible. And my kids remember them well! They can quickly recall the main events and persons of the books of the Bible that we have covered. I love what I have learned while using this program with my children. I have learned so many Bible facts and have noticed many important details from the Bible stories as we have read them together. I have been so impressed with this program. My kids have amazing retention of Bible facts and they are starting to put the flow of Bible stories as they fit into historical context. Curly has been able to locate places on the map and place events on the timeline. I have learned new facts and understand the context behind many of the stories. It has been a learning experience for the entire family! We love it! I’m still on the fence about the Primary Pages. I find it a little cumbersome to teach with the Teacher Guide along with the Student Pages and there is no way I could have Tiger and Bee in the Beginner Pages with Curly in the Primary Pages at the same time. So, this level doesn’t seem to quite fit with the mission of the program to allow multiple students to cover the same Scriptures while studying at the same time. I know I’ll continue with the program, but we might need to streamline things by putting Curly in the Intermediate Level so she can be more independent and I can work with my younger kids during Bible time. However, the Primary Pages would be perfect if you only had students in this one level. Read reviews from the rest of the Crew!